The primary reason I started blogging was because I wanted to help others. I wanted to let others know about Postpartum Depression and Anxiety. I needed them to know that they weren’t alone, and recovery was possible. This blog gave me a new purpose. It provided a way to give back that was meaningful and fulfilling. Another opportunity has come up to help others. A local postpartum group is looking for volunteers for their support line. They wanted people from various backgrounds (Mothers, Health Care and Mental Care Professionals, SAHM, etc). I thought that I could help women who were like me. I wanted to give them the reassurance that they weren’t alone and resources were out there. Sometimes, it’s best to hear from someone who’s gone through it. Any instance where I could not fall asleep instantly. I constantly worried about my son so I wasn’t able to fall asleep most days. It’s one thing to read a blog, a group post or a text from someone experiencing the issues. You have time to process. You have a moment to evaluate what’s happening and you can take time to respond. You can move away from it if you need to. A support line is entirely different. You are facing someone’s issues head on. It could be similar to what I felt. It may be heartbreaking and difficult to hear. I wonder, could those retrigger old fears and feelings? If I am in recovery, doesn’t it mean that I’m better equipped to deal with things like that? Am I immune from falling into my old spiral? If that happens, how useful would I really be? Sadly, this is what is keeping me from moving forward. I want so much to help others, but I cannot do it at the expense of my own well-being. No one else can make this decision for me. I definitely have a lot of thinking to do in the next few weeks. I guess I have to weigh it out …what do I want to feel? Regret from not taking up on opportunity to help? Fear from a trigger point – which can be helped or addressed later. I have an interesting choice to make soon. You have such a kind and true heart to want to reach out and help others. Hello wonderful, strong lady. I hear you! I had PND and anxiety after the birth of my second daughter two and a half years ago. I too have this overwhelming feeling of wanting to help others in a similar situation- I want yo compile a book with people’s experiences and what got them through. I’ve written and intro and know a couple of charities that I would like to approach for help but it has come to a temporary standstill. I have not gone back to how I felt directly postpartum but I do have wobbles and do find it hard work still keeping my mental health in check. Sometimes o have to take a step back from things for a little while. I think it’s really admiral that you want to help. I also think it’s brilliant that you aware of how it could potentially effect you. My advice is go slow. Explain how you are feeling to the organizers. It may be that they have support available for you too. You know most councillors also speak to someone to help them? Do you have a little support network go you can inform of you do choose to go ahead with it? That way they can be ready to look out for any signs of relapse and be ready to help and support if needed. I think you’re absolutely right. I also admire you for wanting to help others. I think a collection of stories would really be a godsend to some women. I do have people in my support system to help me, so I will definitely reach to them. I wish you the best of luck too! It’s so good you have the desire to help others. Do so when you know it’s right for you. Thank you for sharing this. PPD/PPA is not talked about much in mama circles. I struggled with PPA with every one of my pregnancies. With this last one, I went on meds right away because I needed to function. I am still on meds and they help me to get through each day. Thank you for opening up and bringing us along on your journey. It makes me feel like I am not alone in this! You have good intentions wanting to help others overcome their PPD. If you feel that it might result in a trigger, then be mindful of that. You still have to take care of you. When are made whole, you will be more effective in helping others. It indeed is a dilemma, but if you ask me, helping out others deal with these situation you did, will make you all the more confident and get you happy hormones circulated. Wish you good luck in which ever decision you opt for. Wow, that is certainly a dilemma. Is it possible that you would feel empowered by helping others who are going through the same thing, and perhaps help your recovery, rather than derail it? I wish you luck with your decision! Thank you for your openness, honesty and sharing. It’s so important to let others know they’re not alone. 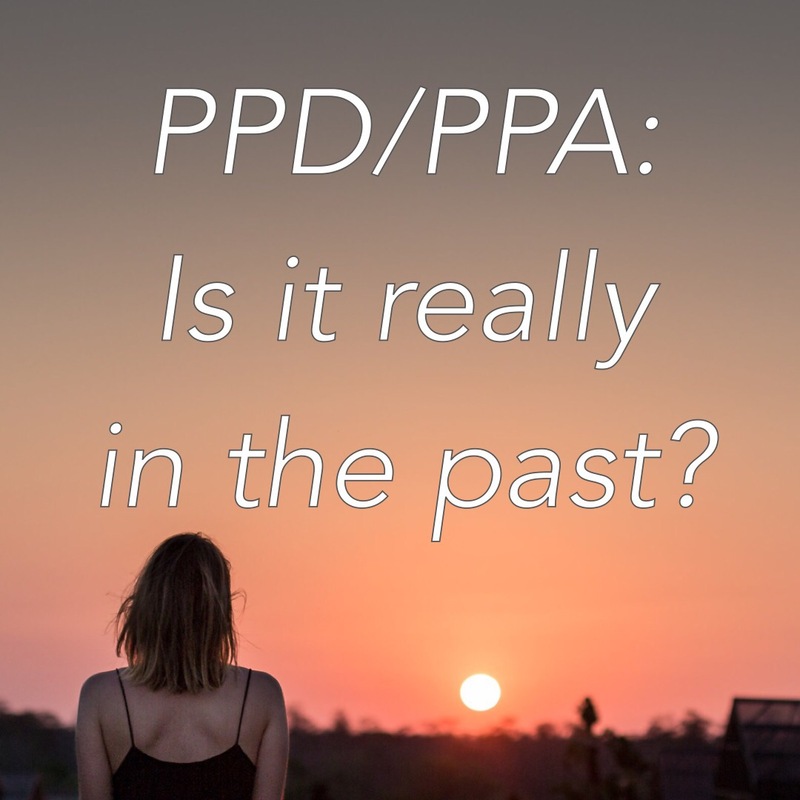 I also struggled with PPA/PPD. I think that even just hearing from someone who has made it through would help someone so much. We don’t have to be perfect to be able to reach people. I appreciate your dedication to sharing about this difficult topic. I have to say from personal experience you have been such a huge help and extremely supportive as I dealt (and still deal) with PPD/PPA. Even when you were going through your dark times, you still took the time to reach out to me and make sure I was okay. I feel like you would be such a strong asset to the postpartum support line- and to all the women out there having a rough time! However, I definitely understand the triggers and I know it would be difficult to hear moms in pain. Maybe there’s some sort of middle ground – you could participate on the support line whenever you felt up for it? Or wait a year and then go for it? You have to do what is best for you, and your own well-being. If you are afraid of trigger points, maybe you just need to wait a little longer before jumping head-first into volunteering for the support line. Blogging and sharing your story is another way of helping others. I love your honesty on such a sensitive topic. I think many of us can relate!